Prairie Warbler. Photo by Joshua Clark via Birdshare. Spring is here, and with it come the warblers, with their spectacular colors and beautiful songs. Unfortunately for many birders, however, spring also means the frustration of learning or relearning warbler songs. When it comes to birding with our ears, almost everyone—including us—is at a much lower level than when birding with our eyes. A big part of this problem is there’s never been any consistent system for studying or learning songs. The Warbler Guide system is based on a simple idea: if you can accurately and objectively describe a sound, you can identify it. As a bonus, when you describe a song you pay closer attention to its details, and it becomes easier to recognize. One reason why birders can identify birds by sight is that we have a whole vocabulary for it: words like “eyeline,” “streaking,” “wingbars,” “upperparts.” But how to describe a song? We might describe it as “sweet” or “rough” or “dark,” but these words mean different things to different people. Or we might focus on the melody, like we would with music. 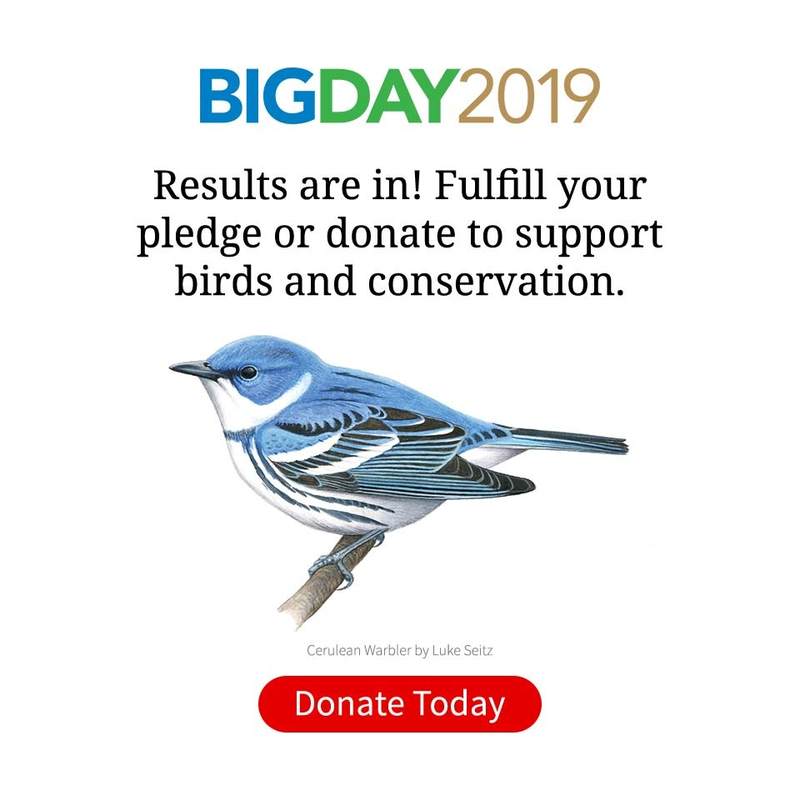 The problem there is that many birds don’t have a consistent melody—try memorizing the constantly changing song of a Northern Mockingbird, for example. Question 1: What is the Sound Quality of the Song? We use a few simple terms to describe sound quality in a song: Buzzy, Clear, and Trilled. To help us visualize sounds, we use a very useful tool called a spectrogram. These show you time from left to right and pitch from low to high (more about how to read spectrograms). Buzzy Like a bee – a good example would be Black-throated Blue Warbler song. Clear Something you could whistle. Cardinals have a Clear song, as do Yellow Warblers. Trilled A lot of sounds in a row that are too fast to count (technically, more than 11 sounds per second). Screech-owls sing a trill, which some birders imitate when pishing for birds. Worm-eating Warbler song is also a trill. One small twist: sometimes a bird can sing more than one quality in a song. For example, a series of Clear elements followed by a Buzz: we’d call that Partly Buzzy. Question 2: What Is the Pitch Trend of the Song? Is the overall pitch of the song Rising, Falling, Steady, or does it move up and down (Variable)? Note that here we’re looking for the overall trend of the song, so if there’s a slight fall in pitch but otherwise the song is mostly rising, then it would still be considered a Rising song. Question 3: How Many Sections Does the Song Have? We break songs down into parts called Sections. A Section begins whenever there is a dramatic change in pitch or speed. Counting the number of Sections in a song can be one of the most effective ways to identify it. Here are a few spectrograms that show a one-, two- and three-Section song. The gray bars at the bottom of each spectrogram show you where sections start and stop. In addition to Sections, we can also talk about Elements (the single sounds in song) and Phrases, which are groups of repeated Elements—more on that later. That’s it! With those three questions, you can describe and separate most warbler songs. Now let’s try some examples. What Is the Sound Quality? This bird has a Buzzy song, which we hear when playing it. We can also see it in the spectrogram: each Element is “fuzzy,” as opposed to straight line, and that indicates a buzz. 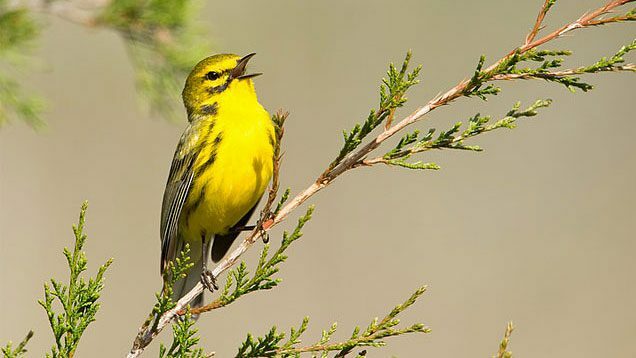 A buzzy, rising, 1-section song means Prairie Warbler. Photo by Scott Whittle. What Is the Pitch Trend? The overall pitch of the song is Rising, with a gradual step up in pitch between each Element. How Many Sections Are There? We can see in the spectrogram that this bird has a 1-Section song. Don’t be fooled by the gradual rise in pitch: although the pitch is changing a little between each Element, it’s a steady change, and there is no sudden change in pitch or speed, so that makes it a single Section. So we have a song that is Buzzy, Rising, 1-Section. If we look in the song finders in the Warbler Guide, or if we enter these three qualities into the Warbler Guide App filter, guess what? We get a single bird! That bird is Prairie Warbler. What Is the Sound Quality? There are a lot of repeated Elements here, but they are relatively far apart, so they’re not too fast to count. That means this is not a Trill, but just a song with a series of Clear Elements. A clear, falling, 1-section song: Wilson’s Warbler. Photo by Scott Whittle. What Is the Pitch Trend? Overall this song has a Falling pitch. As a side note, you might notice a subtle shift downward in the second half of the song—that’s a good indicator for many Wilson’s songs. How Many Sections Are There? This a simple, one-Section song. There are no other warblers that have 1-Section, Clear, Falling songs, so this description is diagnostic in both the East and West. What Is the Sound Quality? Unlike Wilson’s, this bird makes a true Trill. We can tell it’s a Trill in the spectrogram by the series of closely packed near-vertical lines—notice that there are far more than 11 Elements per second, which indicates that it’s too fast to count. But now notice that there is a second section in the song, and that section is just a single Clear Element. Because the song has two qualities, we’ll call it Partly Trilled. A trilled, rising, 2-section song: Northern Parula. Photo by Scott Whittle. What Is the Pitch Trend? The first Section of this song is clearly rising, and the second doesn’t change that much, so we’d call this a Rising song. How Many Sections Are There? We can see two Sections here: first there is a long Trill, with a Rising pitch trend. But then there is a very different, fast, clear, up-down Element to finish the song—that’s the second Section. So this is a Partly Trilled, Rising, 2-Section song. Once again, this song has a diagnostic combination: a Rising Trill with a clear up-down element at the end can only be Northern Parula. In fact, all of Northern Parula’s songs end with that distinct, clear, higher up-down note, which makes it a very handy diagnostic quality to know about. So by looking at three basic qualities—Sound Quality, Pitch Trend and Structure—we can finally make an accurate description of a song, and often find things about it that identify the bird to species. You can use the answers in combination with our book and app to quickly find the bird you’re hearing. 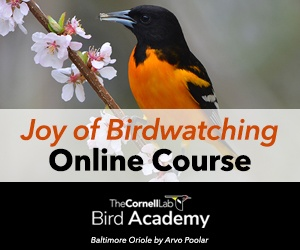 Even for non-warblers, applying these questions will help you hear details in songs that will make you a much more effective listener, and a much better birder! And if you’d like to learn more songs—download this guide to the songs of eight species, each of which has something diagnostic about it. Scott Whittle and Tom Stephenson are the authors of The Warbler Guide and the Warbler Guide app, from Princeton University Press. 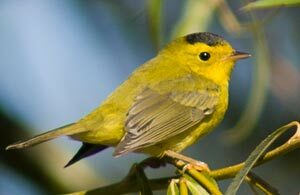 Warbler recordings are via the Cornell Lab’s Macaulay Library.